My 2009 safari in East Africa took me back to the edge of Kibale Forest, a high-altitude rain forest ( a jungle, in fact) in Western Uganda. The forest lived up to its name with rain pelting down in dramatic outbursts most days. When the clouds cleared it became humid and warm and felt quite tropical. I had been there a few times before so it was quite wonderful to see the villagers who live nearby, people I had smiled and waved at in past visits. 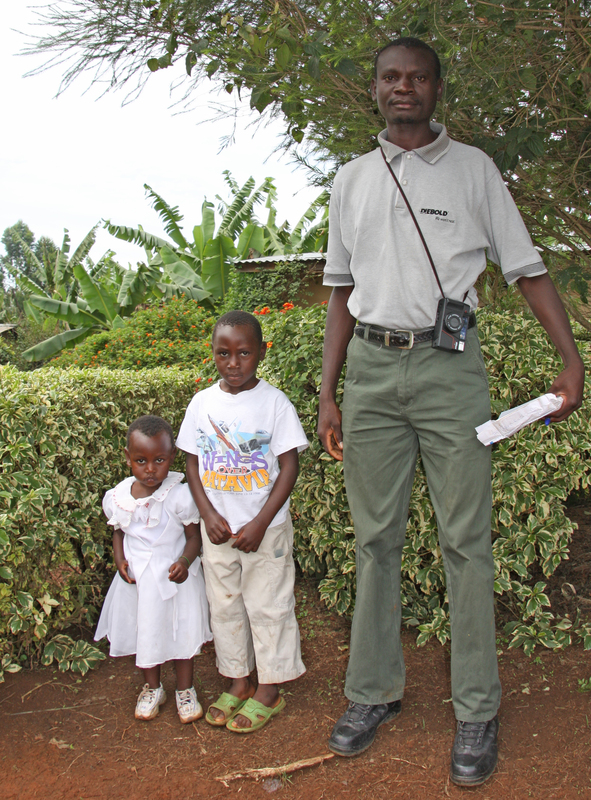 They seemed to remember this white-haired mzungu with a camera around his neck who wandered along the road taking pictures of birds and butterflies and kids. 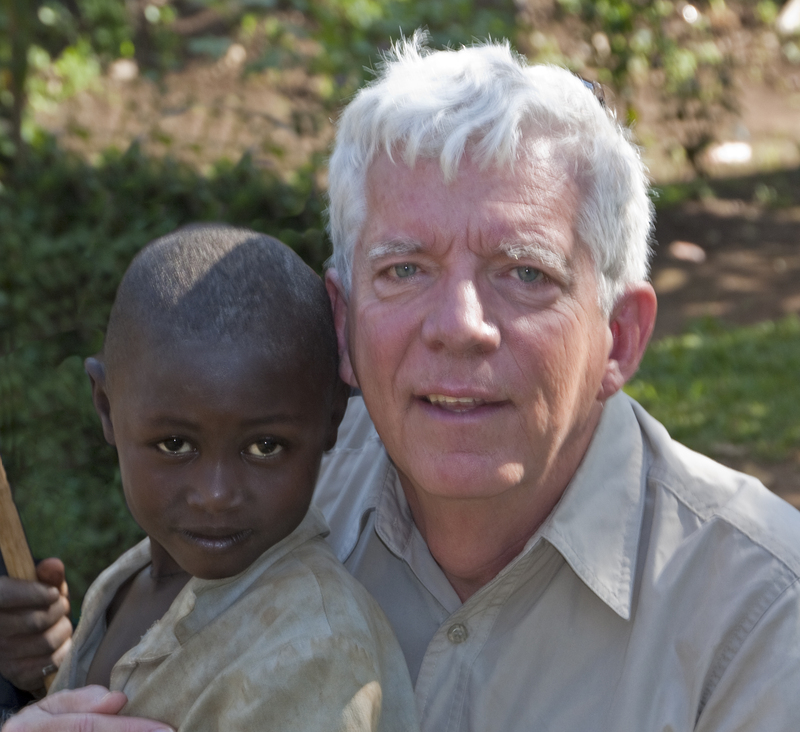 I have tentative plans to return to Kibale for a few days in September 2013 and am very much looking forward to it. On my daily walks, as I followed the red dirt road into Kanyawara village, I was aware of being watched by several sets of eyes. An old baboon sits in the grass, scratching himself and looking like he’s a spectator for a parade. A big brown cow stops chewing for a moment to look up as I pass and children peek from behind curtain doorways. Some of the bolder ones run out to greet me with “How are you?” the only English phrase that they know. One little girl is dressed in a torn and dirty party dress and most of the children are barefoot. I stopped along the way to visit a young fellow named Mark who is a progressive entrepreneurial type. He had purchased a plot of land that sloped down into the valley. He grows all of the food needed to feed his four children and has some left over to sell. As we chat, he hands me a carrot pulled from his garden and I munch on it as we walk. He introduces me to his 9 year old son, Moses, as “Geddes, my friend from Canada”. He and his wife have been digging sweet potatoes and pulling up plants that have peanut-like clusters on the roots. Ground nuts, or G-nuts, are a staple here. Mark also knows that they enrich the soil somehow so he intercrops them with other plants. We walked under the banana trees and he pointed out various other crops – greens, peppers, tomatoes, potatoes, cassava and arrowroot. Avocado trees form a border for his lot. He sells the fruits for less than ten cents each. He breaks off a fresh pineapple from a spiny bush and cuts it up for me to savour. There is no comparison in taste between a tender, sweet, fresh pineapple that is five minutes from the plant and the pale sinewy ones we often get in the super market. I leave Mark with thanks for his hospitality and carry on. I’m on a bit of a mission. I have with me a photograph of Rose, a waif who I have seen by the side of the road every year for the past four. When I first encountered Rose in 2006, she was a sad little waif on the side of the road. When I get to her village, Rose is nowhere to be found. Knowing that many children in Uganda succumb to malaria or malnutrition before they reach the age of five, I worry that she is OK. I show Rose’s picture to a woman who is sitting under a tree as she weaves a basket from coarse grass. She shakes her head then points vaguely across the road but I can tell from the look in her eyes and absence of a smile that I won’t find Rose there. Rose in 2007. I knew she remembered me from the year before. A man sitting in a doorway looks at the photo and tells me that this little girl is not here any more. Both her parents died within the past few months, her mother on Christmas Day. 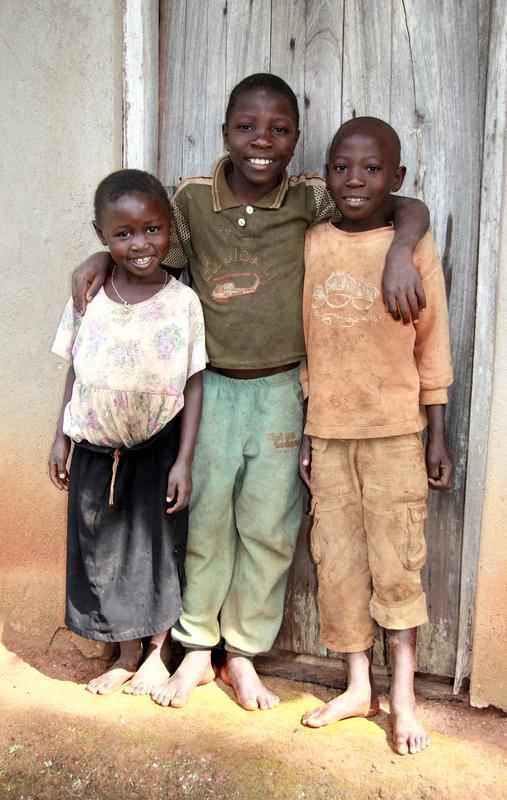 She has gone to live with grandparents in another village – the stereotypical African orphan story. He says he will try to pass the picture on to them. Disappointed, but glad to know that Rose is alive, I start to head back to the research station. Soon I am joined by four young kids who have been following me around the village. The youngest, about four years old is dressed in a one-piece red pajama outfit, the dome fasteners up the legs and around the crotch all undone. She grabs my hand as we walk. I think of how trusting and open these kids are with me, a white foreigner from the other side of the world.. In North America, we have scared our children so much with warnings about strangers that they have become fearful and suspicious. There must be a happy medium. As we walk, the kids want me to go up a side road. I don’t understand their Rutoro language nor do they understand my English, but it is clear that they want me to follow them, perhaps to their home. So, also in a very non-North American way, I let these kids drag me half a kilometre up a narrow roadway lined with tall grass and banana trees. We come to a driveway that leads to a small house. Outside a mother is sitting with a baby on her lap. Beans boil on an open fire in a mud kitchen hut. Three other kids are playing in the yard. One of them is Rose. Rose in 2009. A happier chid living with grandparents and brothers after both parents had died, likely of AIDS. She looked happy and healthier than when I saw her the year before. Shyly she came to greet me. She remembered me for sure and once again, I checked out the scar on her leg that reminded us both of our first meeting when I treated an open sore there. We were all smiles and I take a few more photos with promises to send them back or maybe bring them myself one day. After a brief visit, I headed out, feeling relieved that Rose was still there – still alive – struggling, no doubt, to get day to day but looking like she will survive. Rose will never know and would never understand the influence her being has had on motivating me to help in Africa where I can. I have trouble, sometimes, really understanding it myself. I will travel to Kibale Forest again this September. 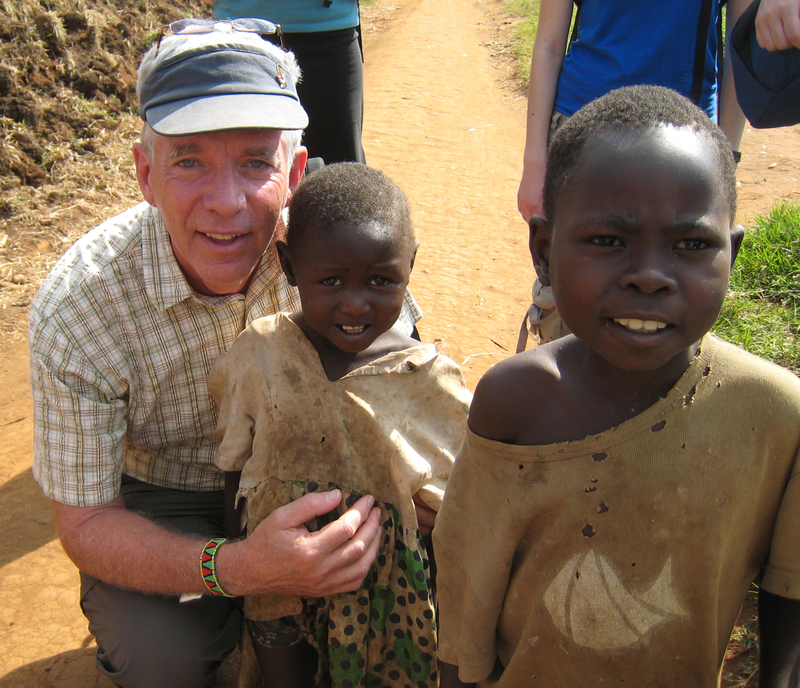 Will our paths cross again in this little town near the Ugandan jungle? Stay tuned. Rose in 2010. Look at those eyes. She will be a teenager now. Will I find her again? I am on a mission. This entry was posted in Uncategorized and tagged Africa, children, Forest, John A Geddes, johnageddes, kanyawara, Kibale, Rose, Uganda by johnageddes. Bookmark the permalink. Hi John – Rebecca here, from the 2008 CFSIA. I remember Rose, too. And I thought of Kanyawara, and our ill-fated football match against Kanyawara FC – I recently met a friend of a friend here in the UK who, it turns out, spent a chunk of his early childhood years living in Kanyawara! What are the odds?! His dad was a doctor of tropical medicine. I told him about our football match in the sloped field with the hoardes of biting ants, and we cracked jokes about mango flies. I felt a very unexpected sense of connection to someone I’d just met, for the sake of that little village, and it left me missing it terribly. Great to hear Rose is doing ok, thank you so much for this! Hi Becca. Good to hear from you. I hope to be back to Kanyawara near the end of September. Keep an eye here in early October as I am sure I will have some Kanyawara musings. Best wishes and thanks for the comment.